It's been so long since I wrote a review, that I think I've half forgotten where to get started! Well, to be honest, this isn't really going to be a review, more of a first impressions because I'm still just playing with the product, so it's still too early to do a full review. 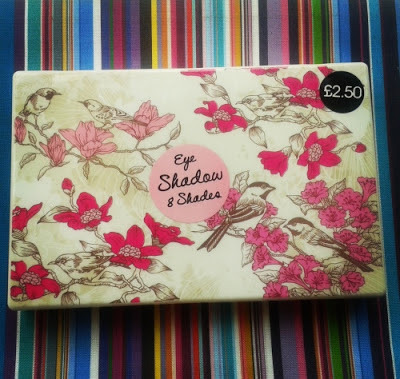 Anyway, last week I found myself in Primark and having a snoop around in their Beauty section, I picked up one of their £2.50 eye shadow palettes. The design of the packaging is really pretty with the pink flowers and the birds. It's quite delicate. In style, it reminds me of the Urban Decay palettes that I have, except this one is made from plastic, whilst I think that the Urban Decay ones are cardboard? Initially, I felt that the packaging seemed quite cheap because it was made from plastic, but in hindsight, I think that I actually prefer it because it seems quite solid and sturdy, as if it could handle a few knockabout's. No filter used on this image. Inside you get a variety of eight different shades, including two mattes and six shimmers. You also get a double-ended brush included, and the lid features a huge mirror. I really love the mirror, because it's a great size. The double-ended brush, on the other hand, I'm not too keen on. One end is a sponge, and I'm not a huge fan of sponges for eye shadow application, and the bristle-brush at the other end is just completely wrong - in my opinion - for eye shadow. It's the wrong shape and the wrong consistency, and I doubt that I will use either end. 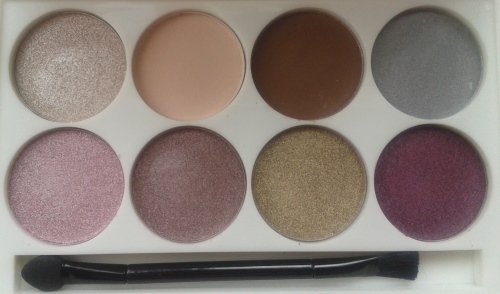 I love the colours in this palette, and can only describe them as pretty. 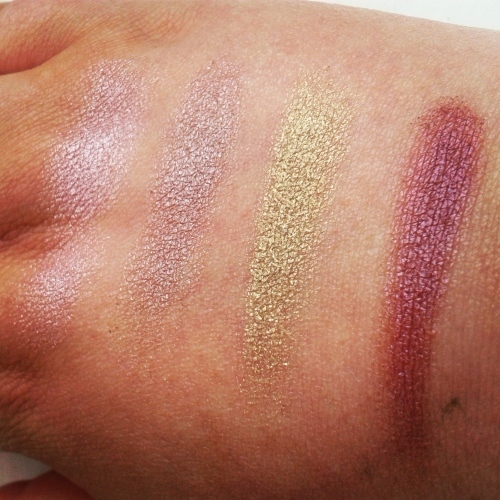 When I first picked up the palette, I had it in my head that this was quite a "neutral" palette, however, since swatching the colours, I'm unsure if that's entirely accurate, but again, that's something I'll discover better from playing around with it. On first impressions, all but the last dark pink shade on the bottom row seem to be quite neutral. 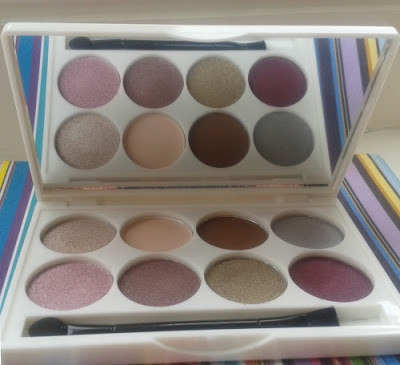 This is a palette that seemed like a complete nightmare to swatch, on camera. So, I'm including images unedited, and with filters to try and help give as close a representation as I can because I don't - personally - think that many of the colours like the same as they appear in the palette. Typically, most of the shades are paler, hence why the unedited images were a pain, because at least one shade struggled to pick up properly. The Top Row features four shades that upon swatching all come out very differently to how they appear. The first pale brown looking shade, appeared almost silver on my finger, but when blended out on my hand, it came out much lighter and I thought that this made a really pretty light shimmer. The second peach-tone shade is matte, and is one that my camera really struggled to pick up at all, and it blends in so well with my skin tone that I'm wondering if this would make a nice concealer. Whatever, it will definitely make a nice base for most neutral eye looks, I have no doubt about that. The dark brown shade, which is also matte, looks like it is going to be a really highly pigmented brown, but in fact, it isn't. 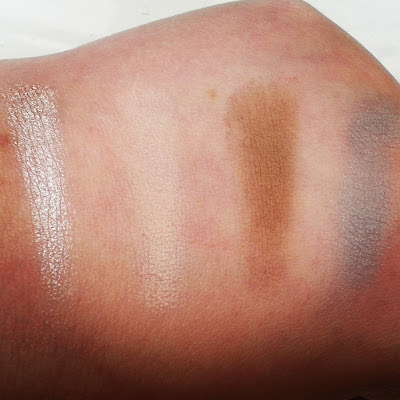 It's a very pale brown, that was also incredibly difficult to swatch, because it seemed to take a lot of effort for the colour to show up. I think that you just need to build this one up, or maybe it will just apply better with a brush, I'm not sure. The grey shade on the end is quite an intriguing colour, because I liked it more than I was expecting to. But then, I'm not really sure what I expected from this shade. Again, it's a very light shade, but I think that it could definitely be built up to create a gorgeous smoky look alternative to black. 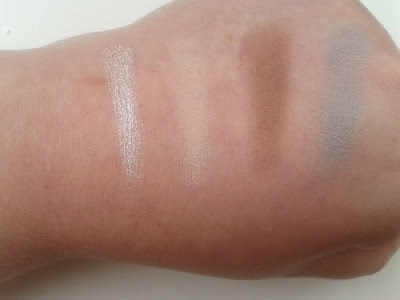 It's strange that both of the matte colours were difficult to swatch. Filter used to draw the colour of the shades out. The silvery shade (the first one) is definitely my favourite with and without the filter. This row was a lot easier to swatch, and all of the colours were fairly similar to how to appear in the palette, which is kinda weird. The pink is a really pretty pale shimmer that is nice and cute, and perfect for when you want a bit of colour, but not too much. It's a really light shade, so ideal for day time looks. The brown is quite similar, although it appears a bit less shimmery. However, it's also quite pale, and would be ideal for day time looks, when you're looking for something that is subtle, rather than overly dramatic. The third shade on the bottom row, I had initially thought of as a green shade, however looking at the swatch and now at the above image, it's not green really. It's more of a gold shimmer with green undertones, and I think that this would look really pretty blended out in the outer v of the eye. In some lights, it can look quite a bold shade, but I think it's quite subtle. As expected, the final plum-pink is the boldest colour of the entire palette, and it is definitely my favourite from this row. It blends beautifully and is such a nicely rich shade that would work as a contrast with many of the other shades. 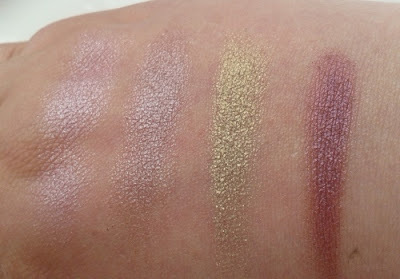 Here are the swatches, without any filtering or editing. Unlike the first row, I think that the unedited image is a better representation of what the shades look like in reality, but I still wanted to show you both, just so that you can see for yourselves. This is a really pretty palette. It's not very pigmented, and most of the shades will probably need building up, but I can tell that these are all going to make some absolutely gorgeous smoky looks. It's defintiely not bad for the £2.50 I paid for it, so I really cannot complain! Have you tried any of the Primark Palettes? Love them or hate them?